Hi guys! I'm in Ohio right now, being busy as all get out, but I had to give you a post anyway! Sometimes certain posts that are older, don't get quite the attention they deserve (largely my fault due to the subpar photography/promoting skills at that time). That is the case for my post about making easy, no ice cream maker, 2+ ingredient ice cream. You guys...I make this ALL THE TIME. 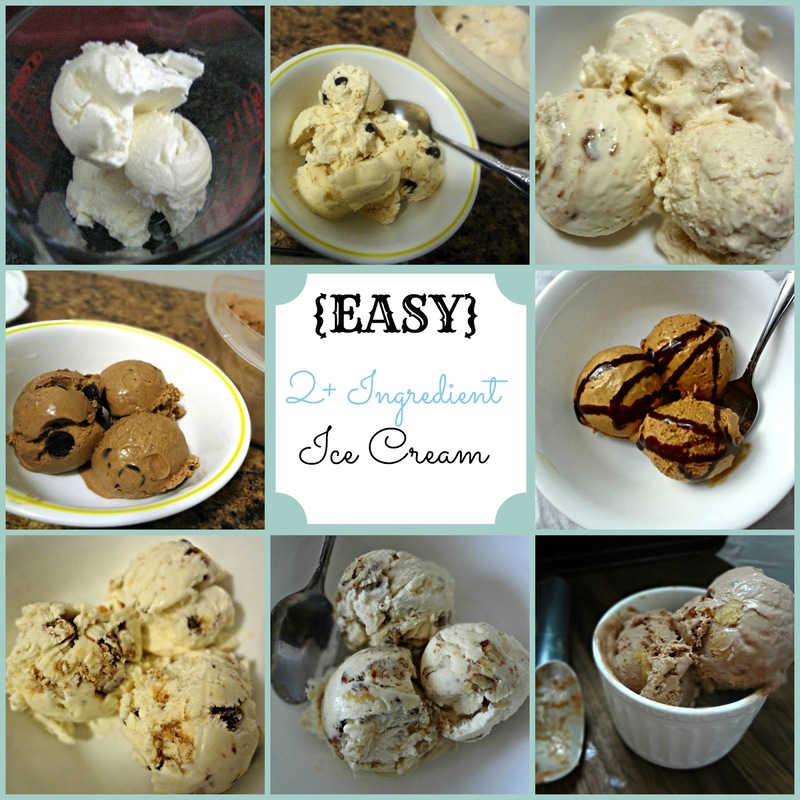 Michael virtually always has ice cream waiting for him in the freezer because this is so gosh darn easy, why not? Plus-it's fun! We can sit down and talk and be like "Hmm...what flavor combo should we try next?" So anyway, today I'm re-sharing the method (especially since I just shared that FABULOUS recipe using it on Friday), and telling you about some of the different flavors I've made with it (and tell you how you can make them too! Although bear with me, all the amounts are approximates because I tend to just add things until they taste how I want) Seriously, this one is a game changer. Whisk condensed milk with whatever add-ins you may have. Fold whipped cream in to the condensed milk. Pretty much simplicity personified. Stir about 2 teaspoons vanilla extract or 1 vanilla bean (or more, depending on how vanilla-y you want it) into the sweetened condensed milk. DONE! Mix peanut butter and chocolate chips (however much you think/want) into sweetened condensed milk. Melt dark chocolate and stir into sweetened condensed milk. After folding in with the whipped cream, fold in some dark chocolate chips. Dissolve instant coffee granules in a little bit of milk. Stir that and some sugar (depending on how sweet or not sweet you'd like it) into the sweetened condensed milk. Serve with chocolate sauce/syrup on top (or mixed in) for mocha! Crush candy bar(s) of choice and stir into sweetened condensed milk. Brown 4-8 tbsp. (depending on your capacity for richness) unsalted butter (click on link to learn how to brown butter). Toast pecans and chop. Cool the browned butter and pecans, then combine with sweetened condensed milk. Take a jar of maraschino cherries. Mash the cherries and combine them, and the juices in the jar, with the sweetened condensed milk. You can also stir in chocolate chips if you'd like. Melt chocolate chips. Chop strawberries into bite sized pieces. Combine with the sweetened condensed milk. Finely crush Andes mints and combine with sweetened condensed milk. Stir some eatable cookie dough into the sweetened condensed milk to form a base. Also take small chunks of the "dough" and freeze them. After folding together the milk and whipped cream, fold in the frozen pieces of dough. Mix crushed graham crackers and either chocolate chips/chunks or swirls of melted chocolate into the sweetened condensed milk. Toast marshmallows and swirl those in too.